If you are a Windows user, you must have observed, Microsoft Edge browser displays “Where to next?” screen by default whenever you launch the browser. In addition to it, the browser now displays ‘Sponsored’ ads. The change can be noticed in versions of Windows that have the latest build of Windows 10 Creators Update installed. 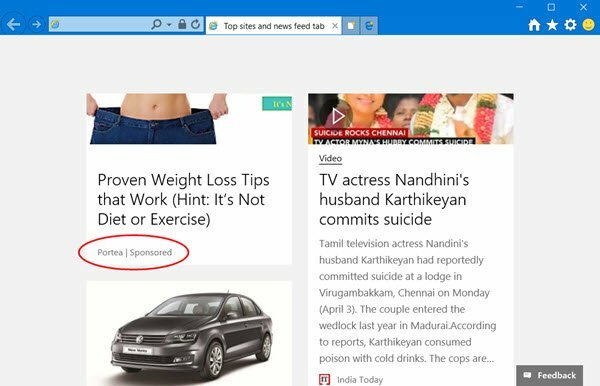 I don’t know if this is something new, but we just noticed that when you open Microsoft Edge or Internet Explorer browser on your Windows 10 Creators Update v1703 PC you will see the Top sites & News Feed tab with Sponsored ads, alongside what’s Next screen. The latter as you know lets you enter your search phrase or web address. The former is a new experiment. Also, you will see Microsoft ads like Get Office 365 as well as several 3rd-party ads. As we know, Microsoft not only generates revenue from its products and services but also from its ads business by offering advertisers more ways to reach different audiences. Sponsored ads is one of them. It’s a new term that has been coined by social network. These ads serve different levels of advertisers, who purchase them through varying channels. This is something new we observed and thought of sharing with our readers. Do you see this change? Let us know in the comments section below. 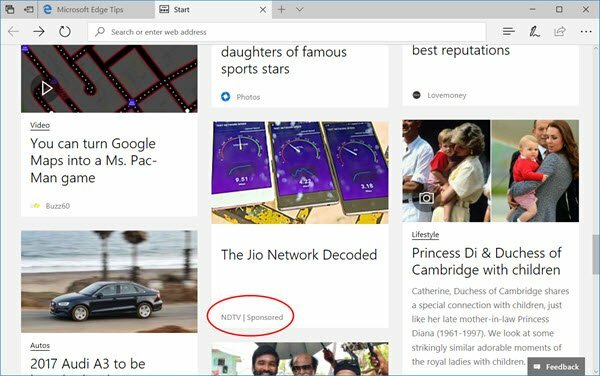 Read next: How to customize or turn off MSN News Feed in Edge browser Start Page. Ads in a paid product is not good. Ads in Free Software is not good either.